Code interpretations are issued by all the model code writing organizations. ASME A17 interpretations can be found on their website. The following are IBC inquiries of interest to the building transportation industry. 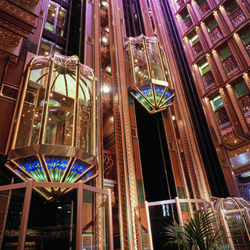 The 2009 and 2012 editions of the ICC International Building Code (IBC) require at least two Fire Service Access Elevators (FSAEs) to serve every floor of a building where a building has an occupied floor more than 120 feet above the street level. This article from the ICC Building Safety Journal Online provides an excellent overview of this requirement. Please note that the ASME A17.1/CSA B44 Safety Code for Elevators and Escalators does not have special requirements for FSAEs beyond the Phase I and Phase II recall required of all new elevators. Also, the article states that "FSAEs must go into Phase I recall immediately upon activation of any building fire alarm". While this is true in the 2009 and 2012 editions of the IBC, NEII® was successful in having this provision removed for the 2015 edition of that code. FSAEs may be needed for occupant evacuation in buildings where such systems are installed, and FSAEs should not be prematurely recalled if they are needed for evacuation. The 2006 ICC International Building Code (IBC) requires at least one elevator serving all floors to be able to accommodate a 24-inch by 84-inch stretcher in buildings four or more stories above/below grade where elevators are provided. NEII's immediate concern has been that a 3500 lb car cannot accommodate a rectangle of this size if the corners are square, but can accommodate a stretcher this size due to its rounded edges. While the 2009 IBC will include language incorporating a 5-inch minimum radius on stretcher corners (thus allowing a 3500 lb car), the 2006 IBC is silent on this issue. On July 28, 2008, ICC staff issued an advisory letter stating that the addition of the language regarding the rounded corners was essentially a clarification of the existing code requirement. Because all stretchers have rounded corners, it was implicit in the 2006 IBC that this design feature could be considered when specifying a car size to meet this code requirement. This ICC staff advisory opinion clarifies that the IBC smoke and draft door assembly requirements for Fire Service Access elevator lobbies (3007.7.3) and Occupant Evacuation elevator lobbies (3008.7.3) do not apply to doors between elevator lobbies and Machine Room Less (MRL) control rooms or control spaces. This ICC staff advisory opinion clarifies the IBC color scheme and minimum size of the symbol required (3007.7.5) at Fire Service Access Elevator hoistway openings. This position paper is issued by NEII in response to concerns about a conflict between the requirements for Fire Service Access Elevators (FSAE) in the 2012 IBC and ASME A17.1/CSA B44. In addition, it addresses a clarification provided by the 2015 IBC.